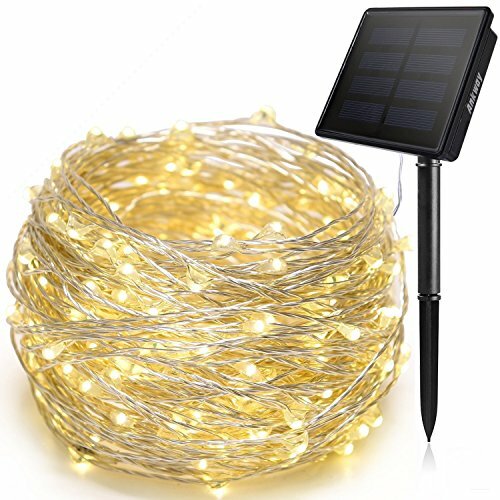 Save 2% each on 200leds Solar String Lights offered by Ankway Life when you purchase 2 or more. Enter code 2TEXXRKG at checkout. More details could check the above promotions. 2. The battery releases energy as light power when in darkness. 5. Be careful of the sharp stake, and please do not hammer or twist it roughly if the ground is too hard. 12-months warranty, Ankway provides high-quality products with good service to all the buyers here. Welcome to contact us with any request. 200 LED BRILLIANT LIGHTS --- 200 Super Bright LED bulbs on 72 feet, 2M/6.56ft length of leading wire high quality solar string lights outdoor. Ideal for decorating your gardens, patio, yard, wedding, party,restaurant,christmas tree, etc. 8 LIGHTING MODES --- Gorgeous lighting modes including combination, fireflies flashing, waves, fading, chasing/flashing, fading slowly, twinkle/flashing and steady on. EASY TO INSTALL --- This solar fairy lights is thin and flexible . So you can build the shapes you want easily , it's easy to store also.Led string lights is wonderful for outdoor christmas decorations. EFFICIENT ABSORPTION & CONVERTION --- LED christmas lights designed with the solar panel and rechargeable battery, the solar lights string can work for about 8 hours at night if the panel absorbs enough sunshine during day.12 Months Warranty, welcome to contact us with any request. If you have any questions about this product by Ankway, contact us by completing and submitting the form below. If you are looking for a specif part number, please include it with your message.